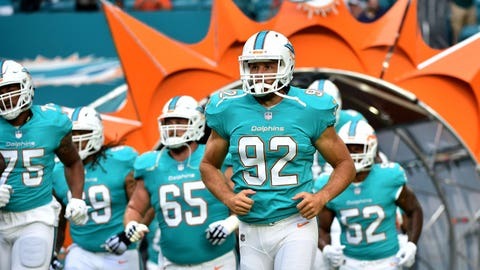 Miami Dolphins 14th-year veteran John Denney is tied for third among active NFL players with 208 games. DAVIE, Fla. (AP) — Miami Dolphins 14th-year veteran John Denney first saw his future career path in eighth grade, when he bent over and looked between his legs. His coach was putting together a place-kicking team at practice, and Denney volunteered to try out as a long snapper. Those cheers might still be the loudest Denney ever received for doing his job. All long snappers toil in anonymity — unless they make a mistake, and Denney doesn’t. That’s why he has been with the Dolphins since 2005, four years longer than any other active player. At 39 he’s among the oldest players in the NFL. Is the hardest part of the job the drudgery of training camp in steamy South Florida? That’s for sure. Long snappers spend much of practice off to the side with the place-kickers and punters, often watching and chatting. It’s not bad duty for $1 million a year, which is Denney’s salary this season. But as with any specialist, there’s pressure. Denney is expected to be nearly 100 percent accurate, and has been. When asked to tabulate the misfires, Dolphins special teams coordinator Darren Rizzi paused to search his memory. “In my nine seasons with him, I think we had confusion once on a field goal,” Rizzi said Tuesday. “Brandon Fields (the holder) wasn’t looking, and John hit him in the face mask. And while the 6-foot-5, 242-pound Denney doesn’t log as many snaps as an every-down player, he does run downfield under punts, and wins raves for staying in shape. Denney doesn’t look his age, but he’ll turn 40 in December. That includes snapping drills. Sometimes Denney recruits his 11- and 13-year-old sons to help, and hikes in the backyard. Like everything else, practice makes perfect. Denney played linebacker and offensive line in high school in Charlotte, North Carolina, and was a three-year starter at defensive end for Brigham Young. All the while he groomed his skills as a long snapper, which is how he made the Dolphins’ roster after going undrafted. He played in every game as a rookie, and each year since he has played in all 16 games — 208 in total. That’s by far a team record for consecutive games, and tied for third among active NFL players. The streak will likely grow, although Denney has nominal competition in training camp from undrafted rookie Lucas Gravelle. It’s one of the few times the team has brought in another long snapper to compete with Denney, but he said he always feels like he’s fighting for his job. That accurately describes life in the NFL. As usual, Denney is right on target.